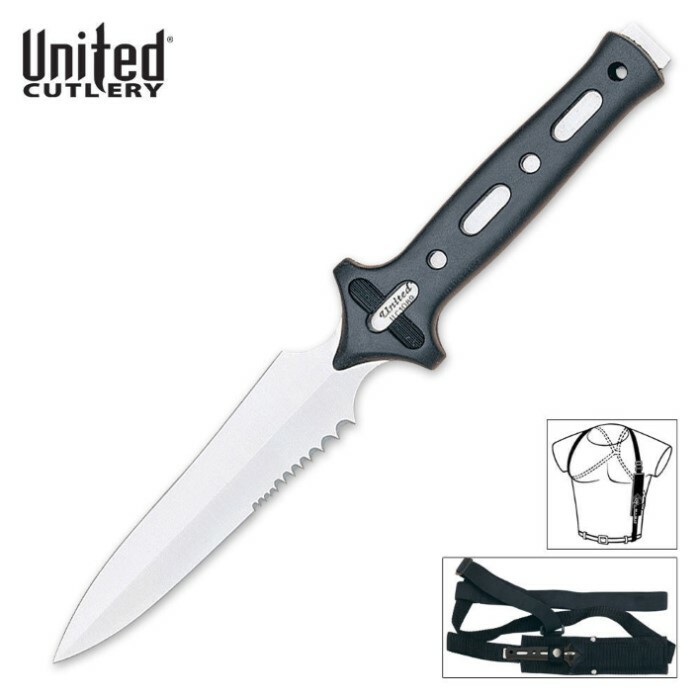 United Cutlery Special Agent Stinger & Shoulder Harness | BUDK.com - Knives & Swords At The Lowest Prices! These special agent stingers from United Cutlery get the job done whether you are a spy in the field or simply desire covert, cabaple personal defense. I would just like to address the issue people keep bringing up about the knife not being sharp. This is a "stinger" blade. That means its purpose is to 'sting' AKA stab. This is not a slash and cut tool or weapon. That's why some come with serration. Just wanted to throw that out there, many of you claim to be some big knife fan and have some big collection, maybe you should learn about the hobby you claim to love so much. like all the special agent knives and I have them all . good blade slap a good edge on it and it will get the job done ... the harness ? works but cheap and the plastic sheath is to big for the blade and rattles around bad !!! I shoved a piece of old boot top in mine with some cement on it ,works great and quite !! I ordered two of these in a BOGO sale because there are times when it is a good idea to have a concealed source of protection. The knife was a little smaller than I thought but is made well with a full tang and injection molded handle over the tang. It is well balanced and fairly sharp out of the box, but with a quick touch-up, it cut the heck out of my finger as I accidentally touched it on the last pass of the sharpening stone. It is well balanced and throws straight, and is good enough to use for more than just throwing. I like mine and have them one each in our bug-out bags. But the shoulder harness could be of a better quality. It is a little flimsy and is not very comfortable to wear for long periods of time (but then again I am 6' and 250 lbs. so it might just be me). very pleased with my purchase,with all my purchases from BUDK.. The knife is a nice solid piece but its bad for throwing and the sheath is horrible. But for the price I'm happy I got to add a new knife to the collection. Very well made, although sharpening is recommended but it's great for concealing and protection. If you wear jackets or vests this works well since it's right there under the arm. You sometimes even forget you have it because it fits well, is comfortable and adjusts to the wearer. Horrible sheath. Very disapointed. The stitching pretty much ripped right out of the box and the knife jiggles badly in the holder. The knife itself is good, but not $13 good. Im going to try and make this work but I reccomend against this product for anyone else. This gets a 3/5 though because you get what you pay for. I appreciate the design implemented in this model. The blade is thick and tapered to produce a potentially kevlar-piercing point and the steel runs through the entire handle, protruding from the back end to present a blunt block of steel which could even be used in an emergency situation; perhaps for breaking a car window?